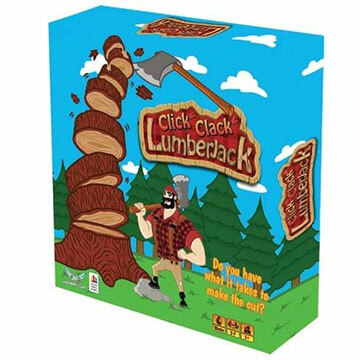 With a similar mechanic to Bash, which was first made in the sixties by Milton Bradley, Toc Toc Woodman requires you to remove the bark from a tree by knocking stacked layers with a plastic axe.This game takes more skill and strategy than Bash because the goal is to leave behind the inner part of the tree. Toc Toc Wooman is a great dexterity/action game that will also draw some comparisons to Jenga. It is, however, quite dissimilar aside from the fact you are working within the realm of a "tower" of parts.